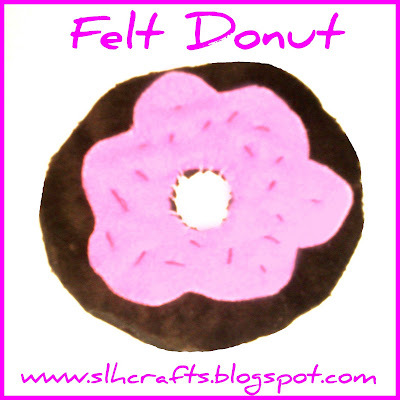 The photograph shows a donut I made out of felt. This was very easy to make, I used a cd to draw around to make the circle shape. I made this by sewing by hand. I made sprinkle designs by hand stitches which also helped keep the pink incing to stay in place. You only need 3 circle pieces of felt or fabric to make this and some kind of stuffing. Two circles the same size for the top and bottom of the donut. and a circle for the icing. You cut the icing into a nice shape. I used a cd to get the shape for the circle and the centre of the circle to cut out. I used some of my mum's wadding to fill the donut. These are also great to make and give as pin cushions for gifts for your family.